Have you ever wished you had a map of the airport when you were on a layover, in the midst of a delay or, worse yet, dealing with a flight cancellation? Or maybe you just wanted to know which restaurant had the best food, or where to find the nearest ATM? With the new features integrated into the United Airlines app, you can have all that, plus self-booking options, in the palm of your hand. The app includes interactive airport maps for major hubs located in the U.S, including Houston, Los Angeles, Chicago, Denver, Washington, New York/Newark and San Francisco, with more airports in the works. You can also use the app to find a seat on another flight if you’re dealing with a flight delay or cancellation. 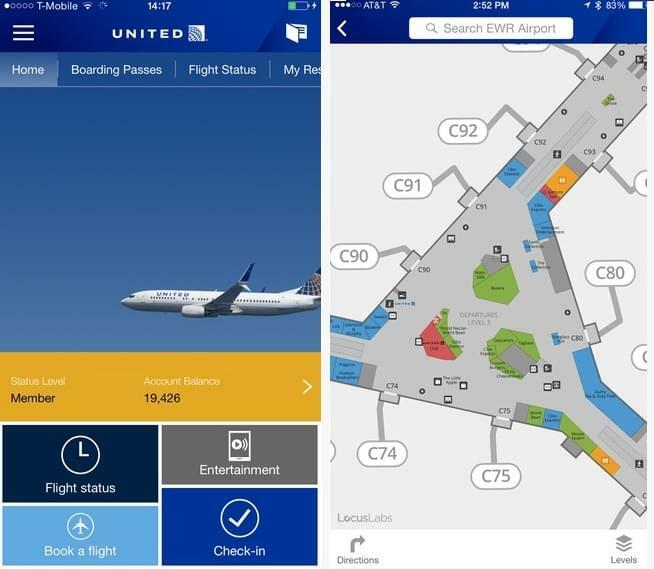 “Travelers are accustomed to using maps and navigation apps throughout their daily lives–and that shouldn’t end when they walk into the airport,” said Scott Wilson, United’s vice president of eCommerce and Merchandising. The interactive maps let users easily and quickly find ATM’s, family restrooms and restaurants located close by. You can also store your boarding pass in the app. Once you do, the app can help navigate you to your gate. Once you’ve pinned your location on the map, the app can estimate how long it will take to get to various destinations, and what there is to see along the way. United is also beta testing an indoor location feature at their New York (Newark) hub. This feature uses Bluetooth beacons to pinpoint the user’s location in the airport to help guide them to a wide range of locations. Once up and running, users won’t have to pin their location. The app will do that for you. The app also includes new self-service functions. When you encounter a flight delay, cancellation or missed connection, you can use the app to find other available flights, including alternate airports, and book a seat. If there isn’t a seat available, you can add yourself to the standby list.